Combat veterans love to hunt. At Freedom Alliance we understand how much this activity means to our service members, especially those who are recovering from combat-inflicted wounds. It means they can participate in a favorite pastime—something they did before all the hospitals, doctor visits, and therapies—all the while being outdoors, in the quiet, with a couple of good buddies. This is rehabilitation in itself. A few weeks ago, our donors allowed us to send several servicemen on deer hunts, one in Virginia and the other in Pennsylvania. When Duane Gardner, of Summerleas Hunting Preserve in Rapidan, Virginia, offered a dove hunt to Freedom Alliance in 2013, he was so affected by the group of veterans we sent, he’s wanted to do it again and again. The next year he invited two servicemen, both amputees, to a turkey and deer hunt. And this year we sent him Scotty and Cody, two fellows from the Marine Corps base at Quantico, Virginia. 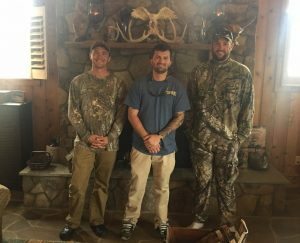 They had been to a Freedom Alliance hunt down in South Carolina earlier in the season, but didn’t have any luck with the deer. So we arranged for Duane to give them another try. Scotty, after two deployments to Afghanistan, is a scout sniper instructor on base. He’s been diagnosed with hydrocephalus, or a build-up of fluid deep in the brain, as a result of exposure to bomb explosions. This has led to two surgeries on his brain, and he is now awaiting medical retirement. Cody will also be retired for wounds sustained during combat. For five years, he made multiple deployments to Iraq and Afghanistan, later returning stateside as an instructor in marksmanship. Using bows, both Marines got their deer at Summerleas. Duane’s friend Bill Allison also contacted us about donating a hunt at his 80-acre farm in York, Pennsylvania. Earlier this month, he had two Marines out to his property on behalf of Freedom Alliance. Jim was a scout sniper with the Marine Corps, deploying once to Iraq, once to the Persian Gulf, and three times to Afghanistan. At the Marine Corps Martial Arts Center for Excellence, Jim was a lead instructor and officer-in-charge. 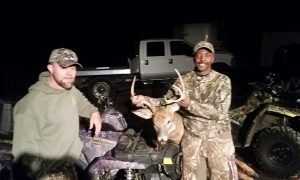 Jim invited a Marine buddy to the hunt, and Dennis found a nice buck on the Allison farm. Dennis served three tours of combat in Iraq. Recently Jim found himself fighting a new kind of battle: cancer. Bill has invited him back to his farm for rifle season, for another shot at that buck.